Pouring rain, crazy humidity and a broken air conditioner didn't stop roughly 150 people from cramming into the Jerome L. Greene Performance Space in New York on Thursday afternoon for the Interactive Advertising Bureau's first Podcast Upfront Showcase. An intimate group of ad buyers, marketers and podcast industry players dealt with the unfavorable conditions—it was about 100 degrees in the room—to preview the latest in innovative podcast programming from some of the biggest names in the rapidly growing medium. 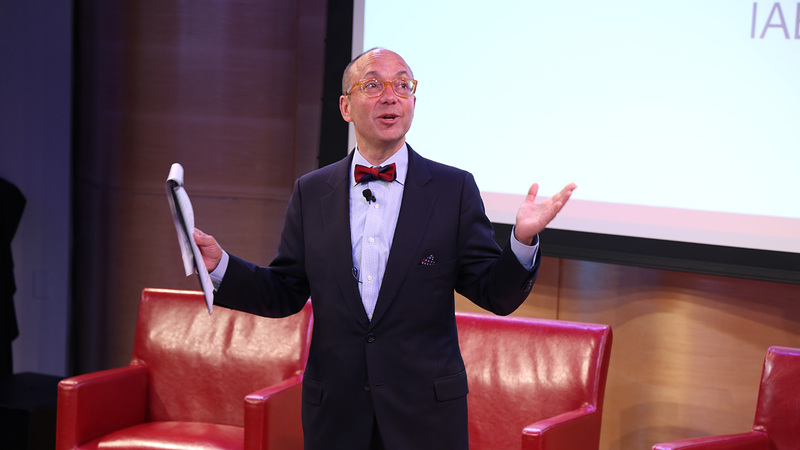 IAB CEO Randall Rothenberg kicked off the event by saying the turnout was "overwhelming" for something happening for the first time. Rothenberg explained that IAB's agency partners urged them to put together a podcast showcase, and that's exactly what happened. The trade org brought star power to the show, with presentations by actor Michael Rapaport, comedians Scott Aukerman and Judy Gold, ESPN host Cari Champion and former pro wrestler Taz, among others. "There is no doubt that the success of Serial and President Obama's interview on WTF with Marc Maron helped open the eyes of many consumers, marketers and agencies to the value and joys of podcasting," Rothenberg said. "There is something going on here that is bigger than all of us." Presenting sponsors Panoply, AdLarge, Podtrac, Midroll, ESPN, CBS, WNYC and NPR each offered a glimpse of their content. Podtrac is the company that sells ads for the groundbreaking Serial podcast, which has received more than 100 million downloads across 12 episodes and continues to grow by 1 million-plus downloads per month. Podtrac CEO Mark McCrery promised that Season 2 is coming this fall and Season 3 will debut in 2016. No official release dates were announced. Every presenter had essentially the same message regarding the audience of their respective podcast: They're a mix of young, loyal, educated and affluent consumers. Slate editor in chief Julia Turner delivered the keynote speech and was quick to point out that one-third of Americans have tried podcasts. "We're all here because we have the sense that something extraordinary is happening with podcasting," said Turner, as the Serial theme music started playing. "The sense that digital audio is a medium poised to hit the big time. We can sense it when the latest cultural phenomenon is this sound." Turner went on to state that "podcasts are mobile ad opportunities that have been hiding in plain sight. Because the ads are oral, not visual, the limitations in screen size have no bearing." Podcast listeners start to think of the host as a "friend" after listening on a regular basis, which is why Turner feels so strongly about the future of the industry. "It's these virtual relationships that give podcast ads their power. Most podcast advertising is essentially native advertising. The ads appear in-stream and the users hear a familiar, friendly voice mention your brand by name," Turner said. "These are ads that listeners truly enjoy." Podcasts are targeted to extremely specific audiences, covering everything from parenthood to fans of particular sports teams or television series. Because of the niche audiences podcasts attract, Turner says their "ads don't just raise brand awareness, they can drive behavior." Scott Aukerman, who hosts Midroll's Comedy Bang Bang, explained that he has fun with his ads, and sometimes listeners don't know where the comedy show ends and the paid marketing begins. It basically all blends together, and the audience is "super, super involved," he said, before explaining that fans often shout his sponsors' slogans at him in public. "Podcasts are the best thing to happen to comedy since the invention of television," Aukerman said.